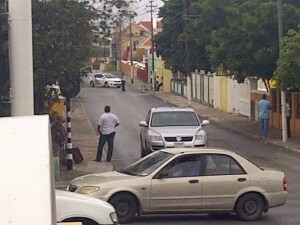 WILLEMSTAD – Yesterday the Colombian Consulate, located at Hoogstraat Otrabanda, received a call indicating that there is a bomb in the building. Authorities were alarmed about the situation and the building was immediately evacuated. The street was also closed and the police started with their investigations. After the investigation it became clear that it was a false threat, but, according to the police spokesman, Alfred Suarez, these threats should be dealt with seriously to guarantee the safety of everyone. Suarez indicated that a bomb threat is punishable and this is why authorities will start an investigation to find out who made this call.